Minimal Intentions: Rocket Stove Introduction. I was fairly skeptical about these things at first. I suppose I still am and as a result I am eager to actually try it. The short version is that it is a large (several tons), cheap, easily constructed wood burning stove that is extremely efficient. It has two fairly unique properties. The first is that the design allows for a horizontal chimney that can be run as far as thirty feet or more. The second is that it burns extremely hot, so hot that it totally burns all the gases that come off the wood to the point that the only thing coming out the chimney is basically warm water vapor. I want to use this for two reasons, heating the earth-bag dome and heating the hot-tub. This is where the 30-foot horizontal chimney comes in. In a traditional fireplace the majority of the heat goes up the chimney with the smoke. 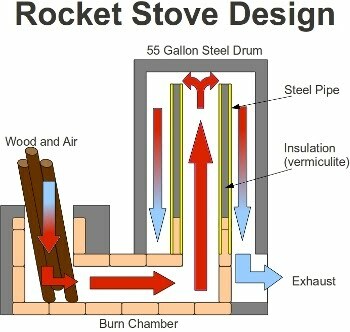 With a rocket stove the design produces a forced-air effect once it heats up and essentially pushes the exhaust through the chimney. In an earth bag dome the chimney can be buried in cob or cement and made into a bench running around the interior perimeter of the dome. The heat conducts through the metal chimney pipe into the thermal mass of the bench and uses the bench and the dome itself as a kind of heat-battery that then slowly releases heat into the dome for long periods. By running the chimney a sufficient distance through the bench most of the heat from the exhaust gas is removed leaving the water vapor coming out end of the chimney only slightly warm. In the hot tub, it would basically work the same way except that the bench will be underwater and will heat the water as well. The materials needed are a large (55 gal) metal drum, a small (20 ish) gallon drum, a few firebricks (15 or so), some high temperature stove pipe and a bunch of regular chimney pipe. The diagram above shows a simple design. The air and wood go in the small drum (not shown) then into the burn chamber this heats the insulated steel stove pipe causing an updraft in the heat riser at the top of which it hits the 55-gallon drum and starts to cool as it goes down the other side and out the chimney. The whole thing is plastered in cob or cement to hold it together and absorb the heat. The top (or the bottom of the upside down 55-gallon drum) can be used as a cooking surface or a boiler or whatever.